This page is dedicated to the theory and analysis of efficient optical focusing. Instead of focusing to standard diffraction limited dimensions (on the order of a micron), we deal exclusively with focusing to nanometer dimensions. The information contained in this site illustrates some of the astonishing energy densities that such focusing could achieve and that this coupling can be surprisingly efficient. The ability to focus the optical field to deeply subwavelength dimensions opens the door to an entirely new class of photonic devices. If one could combine the imaging powers of X-ray wavelengths with the economy and maturity of visible light sources, one could greatly broaden the practical engineering toolbox. Imagine focusing visible photons to spatial dimensions less than ten nanometers. By doing so, electron beam microscopy is immediately displaced by optical microscopy, replacing expensive electron beam sources with inexpensive visible lasers. Beyond simple economics, though, this achievement would allow for the nanoscale imaging of living biological samples. In addition to the goal of nano-scale optical energy concentration and focusing, we add the constraint of efficiency. It is not sufficient to simply deliver optical energy to a nanoscale spatial regime. This coupling must be done efficiently to launch a technology node. Such powerful focusing could then be used to generate optical nonlinearities with very low photon counts. Enabling a suite of novel non-linear devices in passive optical geometries, this leads to novel optical switches, all-optical logic and highly sensitive detector arrays. All of these reasons compel us to address the physical and engineering principles that determine the smallest volume to which light can be efficiently focused. A simple thought experiment can clarify some of the ramifications of efficient optical coupling to the nanoscale. Consider the energy of a single visible photon. For the sake of quantitative discussion, a red photon is chosen at 2eV, yielding a free space wavelength of 620nm. The reader is now asked to forego the objections of the Heisenberg Uncertainty Principle or the classical diffraction limit, and simply consider the energetic implications of confining the photon to a volume of 1nm3. The details as to how we will arrive at such confinement are postponed until after the motivation has been established. This geometric scheme is illustrated below. Optical energy density is not a standard figure of merit for most photonics engineers. Serving as a comparison to a known quantity, we now consider the sun. As the reader is well aware, all life on earth as well as most of the heat in our solar system, is powered by the optical energy radiating from the surface of the sun. 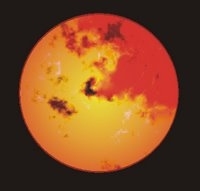 The sun can be modeled as an ideal black body, which permits the use of a variation of the Stefan’s law[i] to determine the radiant intensity over all wavelengths emanating from the sun’s surface. Dividing the intensity by velocity yields the optical energy density, which is computed below, assuming a black body temperature of 5,400K. The discrepancy between the energy densities of these systems is startling. The optical energy density, summed over all of the frequencies emanating from the sun, is more than a billion times smaller than that of a single red photon focused to the nanoscale. Clearly, compressed optical modes have enormous energy densities. In fact, the electric field of our nano-focused photon is on the order of 1010 V/m. These levels of optical compression are great enough to achieve optical non-linearities in common materials with very low photon counts. For instance, Silica glass[ii] has a non-linear index coefficient (n2) of approximately 6 x 10-23 m2/V2. Achieving a 1% change in refractive index, then, requires only 8 photons. 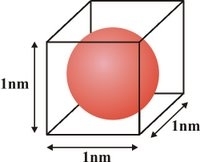 Employing more exotic nonlinear materials, such as lead-silicate or chalcogenides, will increase the changes in refractive index by orders of magnitude. Thus, focusing to the nanoscale will allow for a new regime of low-power nonlinear optics. [i] D.J. < xml="true" prefix="st1" namespace="">Griffiths, Introduction to Electrodynamics (Prentice Hall, Upper Saddle River, 1999). [ii] R. Zia, Guided Polariton Optics: A Combined Numerical, Analytical and Experimental Investigation of Surface Plasmon Waveguides, PhD dissertation, Stanford University, 2006.